For a festival built on New Age principles, Glastonbury sure is looking futuristic this year. There's an app laden with live video streams. There's a Wi-Fi enabled tractor and there's even a dedicated 4G network, all bringing a taste of the big city to the traditionally reception-challenged Worthy Farm. Google Music vs Spotify: which music streaming service is best? Glastonbury has always suffered from patchy, unreliable mobile phone signal. It's like New Year's Eve all day every day, with texts taking hours to deliver and bellowed phone calls audible only half the time. And while some people head to the festival to disconnect from both reality and their data networks for a few days, others fear long, dry days devoid of Instagram and iMessage, lost somewhere between the cider bus and Shangri La, doomed not to find their friends until they all stumble back to pass out in the tent at 5.30am. It doesn't help that Worthy Farm is slap bang in the middle of the countryside, where the big city infrastructure is yet to infiltrate. Why bother digging up the land, laying expensive cables and investing in next-gen networks when only 8,700 people live there for 98.6 per cent of the year? Patchy rural connectivity is a big problem though and, while we doubt that Glastonbury is its top priority, it is one the government is looking into. More immediately, Glastonbury Festival is unique in that, for one week a year, it brings an urban-size population all expecting to text, call and tweet their way through the festival, and dumps it on to a rural network that struggles to support even a super low countryside density. So while the town mice have begun flocking to Worthy Farm this week, EE, one of the festival's sponsors and provider of the mobile network onsite, has already been beavering away there for months - but how exactly do you bring a big city network to the middle of nowhere? Taking a leaf out of the hipster book, EE has basically brought along its own pop-up network. "If you have masts that are all very close together you can provide more capacity in an area so you can support more users," EE spokesperson Mike Thompson explains. "So in a rural area you have masts that are further apart because you don't need to be able to provide coverage or capacity to as many people. It's as simple as that." So rather than try and use what's already there, EE grabs some trucks, loads them up with masts and drives them on down. "We take a portable version of our mobile phone network - and it literally is base stations and masts on trucks that you drive down there and position around the site strategically. "Then we deploy a 2G, 3G and 4G layer for the network, so there's service for all levels of customers - a lot of people we might see at the festival are people taking their old Nokia 2G phone because they only want to call and text rather than go on Twitter or stream video or any of that. "Basically, we're throwing everything at it." Specifically, EE has five mast sites positioned around the festival, with 250 transmitters between them. While there's no telling if EE's "everything" will be enough until the festival hits its stride later this week, Thompson is confident of the network's capacity - or hopeful, at least: "We believe there's enough in there to support everybody on the network." There's an argument that the whole 4G festival thing is one big publicity stunt. Because, really, who wants to risk their expensive top-of-the-range smartphone when there's the triple threat of mud, crime, and abundant opportunities for drunkenly dropping it into the rancid long-drop toilets? Even EE admits that it's very difficult to predict how many of its customers will make use of the 4G network on site. There are only around 500,000 4G users in the country, and the proportion of them making the trip to Worthy Farm with their expensive smartphone in tow isn't necessarily huge. "We're not expecting there to be hundreds of thousands of people at Glastonbury all using 4G," Thompson concedes, adding that EE sees the Glastonbury network as kind of an experiment. "What we are expecting is that there will be a reasonable amount and enough for us to get a real sense of what they're doing and what they're doing differently. Most people will be on 3G and a lot of people will be on the 2G network. But it's key to be able to enable all of those layers. "We're hoping that, by enabling a 4G service, people think: I don't need to ditch my iPhone and go back to my old Nokia phone, I can actually make use of the thing I rely on day-to-day when I'm at home. Or bring both, as a back up. The network can support any of those layers." 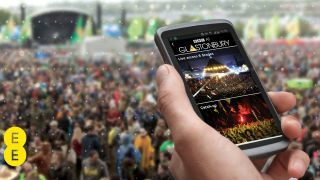 But Glastonbury-goers not on EE needn't despair: the pop-up network supports all the major UK phone providers to a certain extent, through a combination of antennas mounted on EE's kit and specialist software in the base stations. Those not heading to Somerset this week might well be hoping that the whole thing falls over to spare them a visit from the green-eyed monster - but no one really knows whether those brag-laden Facebook posts, Instagram photos, Vine videos and garbled drunken tweets will get through until the 150,000-strong crowds descend. Not going to Glasto? Try Twitter music for some serendipitous musical discoveries.